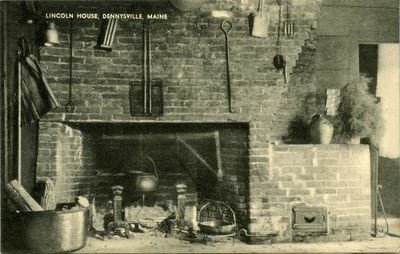 "Dennysville, Maine, Lincoln House Interior, Fireplace "
A black and white postcard of the interior of the Lincoln House, focusing on the fireplace. Saved with a page of information: "Theodore Lincoln VI, 1768-1852, Proprietor of Twps. No. 1 and No. 2." Part of the Dorothy S. Casey collection on Dennysville, Maine.